It turns out that "interesting times" is not a Chinese curse (or anyone else's curse) at all. Nevertheless, Abq Jew thinks we will all agree that we live in interesting times. Danger and uncertainty surround us; we just need more creativity to sustain us. And therefore: Jonathan Chisdes of ChizFilm Jewish Movie Reviews (see Restored! 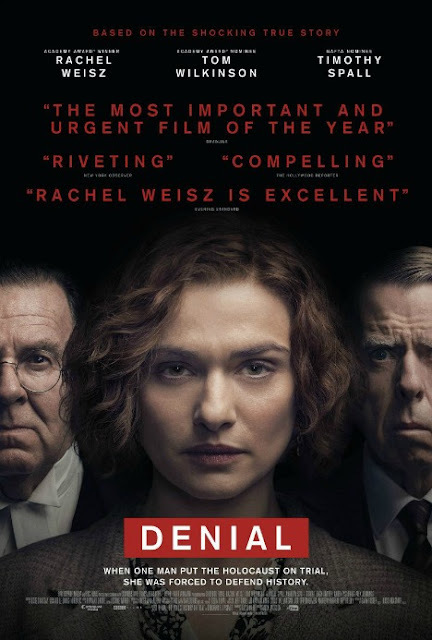 The City Without Jews) has just published a review of the 2016 film Denial. Which Abq Jew would like to encourage you, his loyal readers, to read and reflect upon. To encourage you to do that (Abq Jew knows you hate to click) - here it is! The last few days have seen renewed controversy over Holocaust denial thanks to comments Facebook CEO Mark Zuckerberg made the other day. Zuckerberg argued he was trying to balance the priorities of “giving people a voice” and “keeping the community safe” by drawing a fine line between direct incitement to violence and false information. Those who claim the Holocaust never happened often stop short of telling people what to do with those lies. As a Jew, Zuckerberg should know better. Holocaust denial has a long history of rousing up anti-Semites to believe Jews have tricked the world into getting preferential treatment and should therefore be punished. Actually, I think this week is a good time to take another look at that film. Though only two years old, it was made in the pre-Trump era when most people considered the issues it debated merely academic. The film was mostly glossed over. Now, it seems far more relevant. 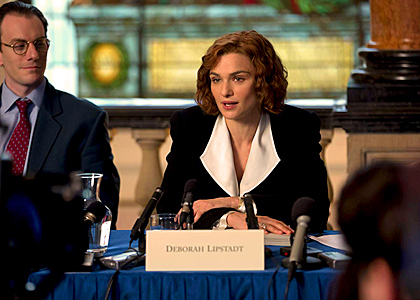 Denial tells the true story of the British court battle between famous Holocaust denier David Irving (Timothy Spall) and American university professor Deborah Lipstadt (Rachel Weisz) who called him a liar in a book she wrote. Irving sued Lipstadt for libel in 1996 and the trial took place in 2000. The movie is basically a straightforward legal drama—nothing particularly noteworthy about its style or artistry—but it does a good job of presenting its issues and legal points of the case. 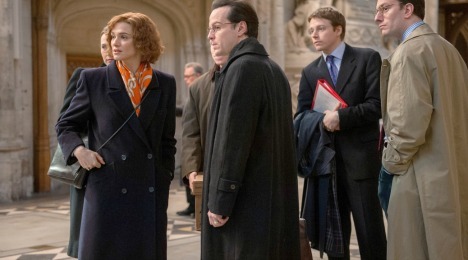 There is particularly good acting from Tom Wilkinson who plays Lipstadt’s barrister and from Spall who does a remarkable job of transforming himself into the despicable, self-assured bigot. But ultimately the real issue of the trial comes down to the question over whether Irving is simply a sloppy historian who has made some honest mistakes in his work, or if he has deliberately misinterpreted historical documents to falsify the record to exonerate Hitler and condemn the Jews. Much of the film is cerebral, but the real emotional show-stopper is a small sequence when Lipstadt and her legal team visit Auschwitz. (It was actually filmed there.) It’s an overwhelming moment and most of the characters can hardly speak. So I think if the film has a real “flaw,” that’s it in a nutshell. It’s not a memorial to the victims or survivors of the Holocaust, but rather an unemotional look at fine points of British libel law. Despite its condemnation of Holocaust denial, the film as a whole doesn’t really change anything. Which brings us back to Facebook and Zuckerberg. The day after he made the controversial comments, Zuckerberg tried to walk it back by saying, “I personally find Holocaust denial deeply offensive, and I absolutely didn’t intend to defend the intent of people who deny that.” But that was never the issue to begin with. It’s what do we do about it? You can accuse someone of being a liar, but that doesn’t stop them from lying. Free speech protects them from being arrested, but someone who provides a platform for the liars (be it a publisher or a website like Facebook) has an ethical responsibility to remove that platform. Otherwise, they are just as morally guilty as the liars themselves for spreading the lies. The film Denial lays out the foundations for calling out the liars. But now what are we going to do about it to stop them? Remember, it wasn’t Lipstadt who tried to stop Irving from speaking; all she did was rightly call him a liar. He responded by trying to stop her from speaking. That put her on the defensive. I think it’s time we flip that.